Our Hills Sliding Door Repairs are Quick & Easy. 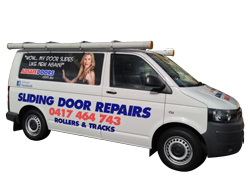 Adsafe Doors has been servicing the Hills District area with sliding door repairs for over 25 years and have hundreds of satisfied customers from Castle Hill to Winston Hills and all the way over to Pennant Hills. then we have a cost-effective solution to get your door sliding smoothly again. Our history in the Hills District is extensive, and we have been operating since 1992, and all our work is quality guaranteed. We only use the best sliding door replacement parts and we are confident of their high standard of manufacture and reliability which guarantees you, the consumer, the ability to open and close your door with one finger. We have been perfecting our sliding door repair process since 1992 and the combination of experience, quality and professionalism means your door will slide better than new. 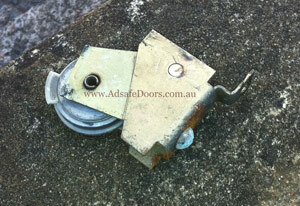 An initial phone call to identify the exact door type and issue with your sliding door. A clear quote, so you are not left guessing about the price. We remove the fixed panel if required. We can dismantle the frame of the door from the Glass if need be. We always replace the worn rollers of your sliding door with better rollers. We replace the rollers every time it is needed to get your door sliding smoothly again. We machine the sliding door track (runner) on the threshold. We return the sliding door to the frame. Over time, rollers get brittle and crack, and with a few pushes in frustration, your door rollers simply disintegrate or develop flat spots and broken edges and your door becomes almost impossible to move. You will notice the image on the right with only one fragment of the roller left. If your door is noisy and or difficult to move your rollers are likely to be in this condition. time to fix your door and get things back to normal. Here we are fixing a client’s door from start to finish. You will notice how near impossible the door was, to begin with, as the track was very badly worn and the rollers were completely disintegrated. Tracks and Rollers are the two biggest issues when it comes to sliding door repairs. We see it all the time. So we will replace the rollers to make your door sliding smoothly and with one finger. This particular job was done at West Pennant Hills and if you watch the video to you will see how the locks line up correctly and how easy it is to slide the door open and closed. No matter if you need your glass sliding door, patio door or your screen doors repaired, we have the expertise to do it. On a side note, garage doors are not something we repair, just sliding doors. For more information on our sliding door repair process visit our Sydney sliding door FAQ page. If you are looking for an automatic door closer specialist then give us a call for a free quote as well.